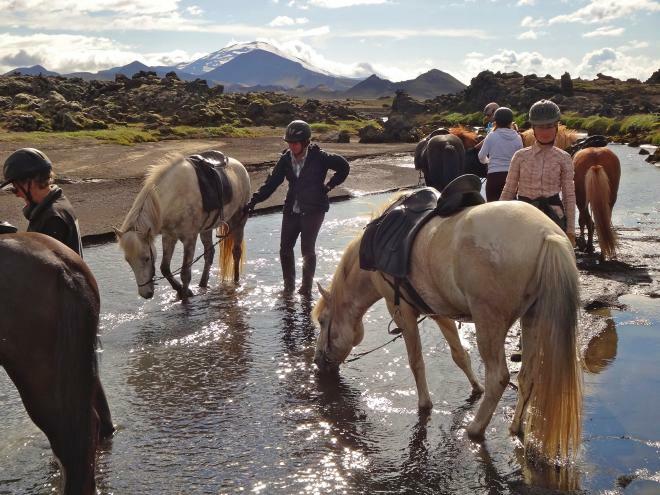 Mount Hekla is a highly active volcano often titled the “Queen of Iceland”. The mountain towers regally over the region and every day we see evidence of its numerous devastating eruptions throughout the ages. In the old times, people actually believed it to be the gateway to hell. 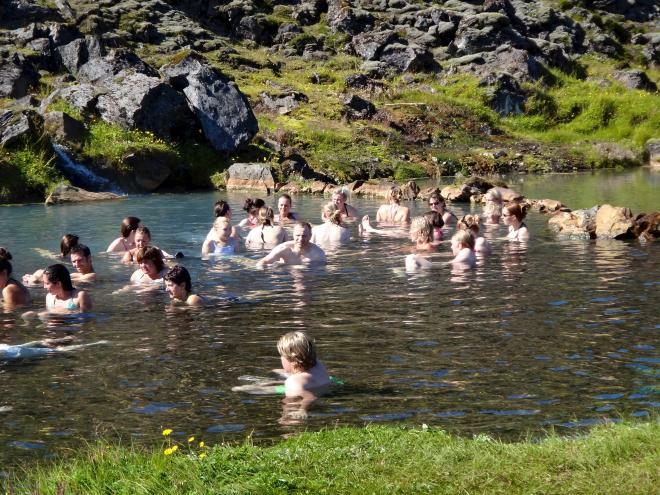 Landmannalaugar is a geothermal wonderland in the Southern Highlands. 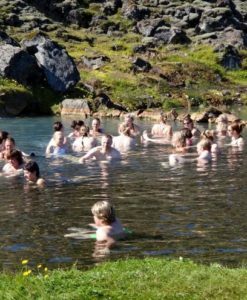 It’s natural bathing pools are only one of the highlights which make this area one of Iceland’s most popular destinations for nature lovers. 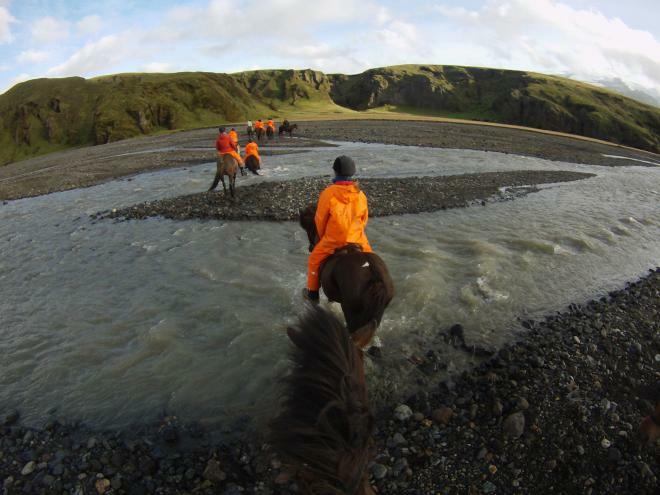 On our way to the Farm Kálfhóll we visit the hot springs of Geysir and Gullfoss Waterfall. 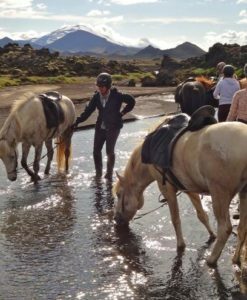 Our ride starts along the river banks of the mighty glacial river Thjórsá, with a magnificent view on glacier Eyjafjallajökull and Volcano Hekla. 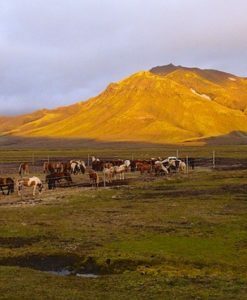 The beautiful area Landmannahellir is a fitting outpost in the central highlands before going on to enjoy the colorful rhyolite mountains in Landmannalaugar, surrounded by black lava fields. 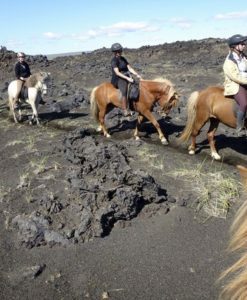 Shared rooms in simple mountain cabins and sleeping bag accommodation during the ride. 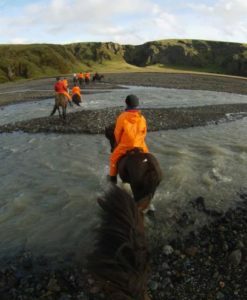 Accommodation before and after the ride are to be arranged individually. 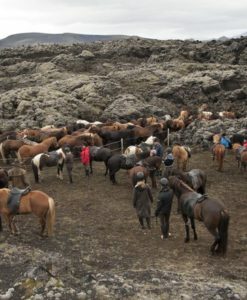 Pick up at BSÍ Bus station in Reykjavik or at Reykjavik official bus stops near your accommodation (see: www.busstop.is) between 18:00 and 19:00, where our Íshesta bus will transfer you and your fellow riders to Kálfhóll farm where horses and staff are waiting for us. After a lovely introductory meal where we get to know each other we relax and rest so we are well prepared for the adventure ahead of us. 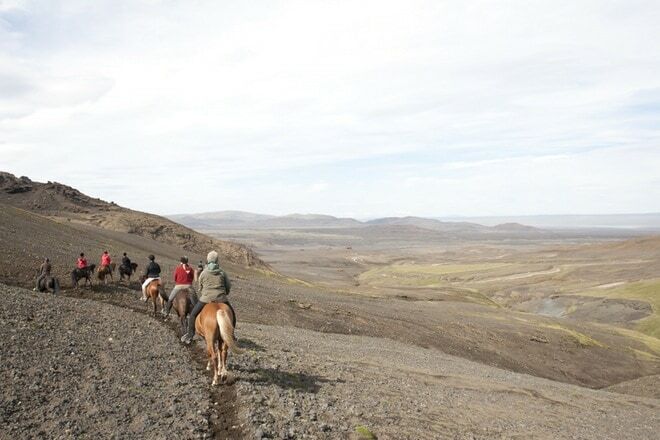 We leave the beautiful area of Landmannahellir and ride on towards the Herbjarnfell mountain. 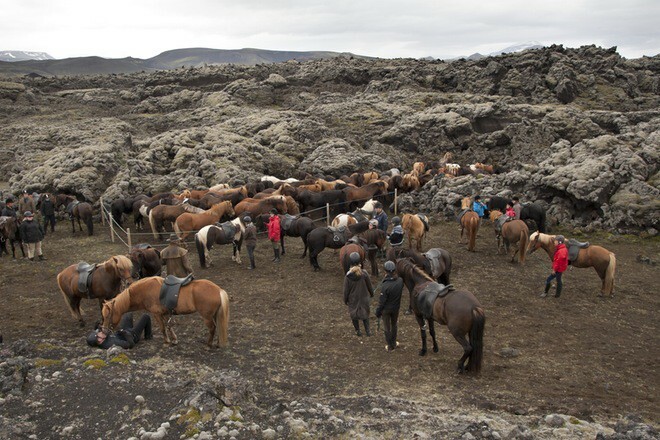 Today´s route takes us over varying landscape. 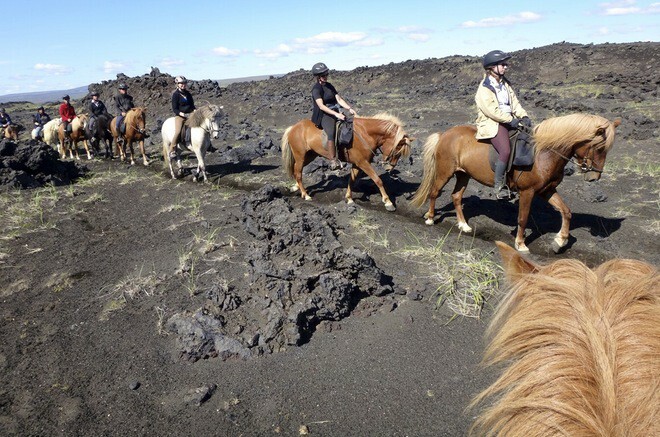 We ride across sanders, sharp lava, huge pumice fields in many colors and over green grazing fields where the farmers drive their sheep during summer. 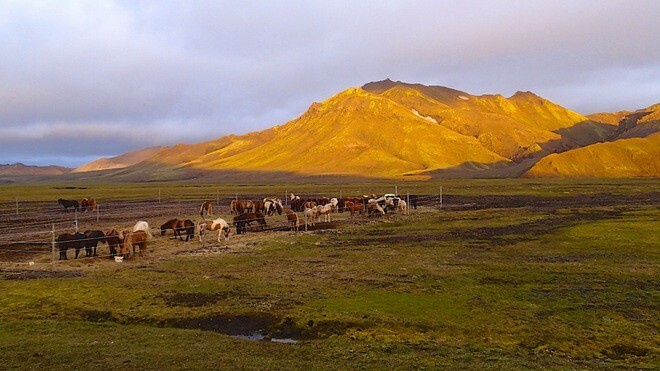 We stay overnight in the solitary mountain hut Klettur with a perfect view of the Hekla volcano. Here we get the feeling of being “on top of the world”. (approximately 40 km). 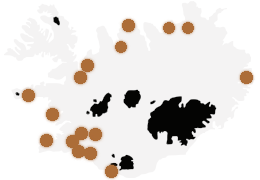 Landmannahellir is located in a peaceful area in Fjallabak and has for many years been one of the main dwelling places for sheep gatherers when they round up the sheep each autumn that has been grassing in this area during the summer. Is a big mountain cabin in Þjórsárdalur, close to the glacier river Þjórsá. 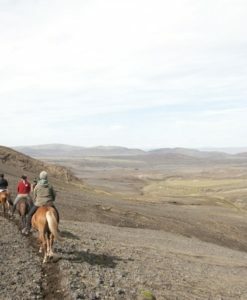 It is used in the autumn for the sheepherders but is open for travelers during the summer.